“What’s the Use of Crying?” Lyrics by Verdi Kendel, music by Louis Forbstein (1926). 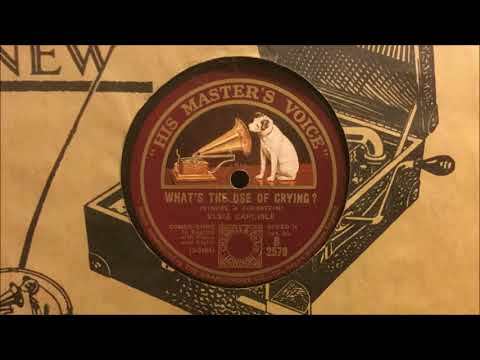 Recorded by Elsie Carlisle, accompanied by violin and piano (the latter played by Arthur Young), on August 22, 1927. HMV B2579 mx. Bb11403-2. Elsie Carlisle’s is the only British recording of this song that I have discovered. It was in vogue in America in late 1926-early 1927, with versions by Lee Sims, Charley Straight’s Orchestra, Ted Weems, Bessie Coldiron (as “The Sunflower Girl”), Greta Woodson, Gypsy & Marta (unissued), Peggy English (as Jane Gray), Bob Haring’s Dixie Music Makers, Harry Raderman (Arthur Hall, vocalist), and Willard Robison (accompanying himself on the piano).